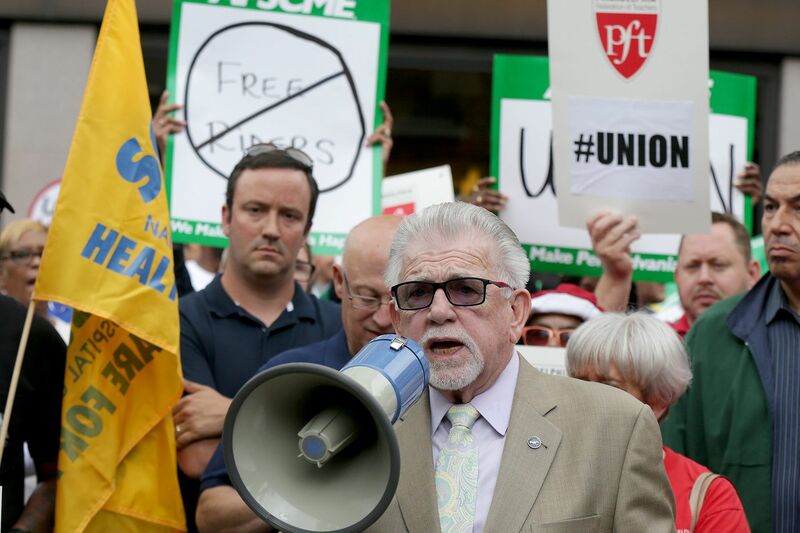 Patrick J. Eiding, center, President of the Philadelphia Council AFL-CIO, speaks during a union rally outside Federal Court in Philadelphia in June. Given the booming economy, American workers should be feeling good this Labor Day about their contribution to the strength, prosperity, and well-being of the United States. But the sad reality is many middle-class workers are struggling and feel worse off today than a decade ago, while conservative groups have launched an all-out assault on unions. To be sure, corporate profits are up and the stock market is enjoying a record bull market that began in March 2009. But what happens on Wall Street does not benefit many on Main Street. Nearly half of the country has no money invested in the stock market. Meanwhile, President Trump's $1.5 trillion tax cut – like previous massive tax cuts – has failed to trickle down to average workers in a meaningful way, and many of his policies are hurting American workers. Just 4 percent of workers at Fortune 500 companies received a bonus or wage increase as a result of the tax cut, according to an analysis by Americans for Tax Fairness, an advocacy group dedicated to tax reform. The tax cuts helped the one group that didn't need a boost. The richest 1 percent of taxpayers will receive an average tax cut of more than $55,000, while the middle fifth of taxpayers will receive a tax cut of $800 in 2019, according to an analysis by the Institute on Taxation and Economic Policy, a non-partisan think tank. The upshot is added growth in inequality as the rich keep getting richer and the middle class continues to shrink. Research shows the rise in inequality in America corresponds with the fall in unionized workers. In the mid-1950s, one out of every three workers had a union job, according to the Congressional Research Service. Today, roughly 10 percent of U.S. workers belong to a union. A concerted effort over the last 40 years by a network of conservative think tanks, corporations, and political action committees has added to the decline in unions. That effort gained steam following the recent U.S. Supreme Court ruling, in Janus v. American Federation of State, County and Municipal Employees, that millions of public sector workers can stop paying union dues. The ruling is likely to hurt private sector unions as well. A recent working paper by economists at Princeton and Columbia universities found that unions helped reduce income inequality in the United States in the decades when organized labor was strong. That bolsters earlier research from 1998 that estimated the decline in unions resulted in 10 to 20 percent of the increase in inequality over the previous quarter century. The rise in technology has also contributed to the increase in inequality as machines replace some blue-collar jobs and displace low-skilled workers who are unable to adapt. Globalization has made it easier and even encouraged companies to close factories and move jobs offshore. But the decline of unions has had a negative impact on the income of non-union workers as well, a report by the Economic Policy Institute shows. Indeed, many Americans are working two jobs just to keep up. So, instead of enjoying a well-deserved day off, many people will be working on Labor Day and beyond.